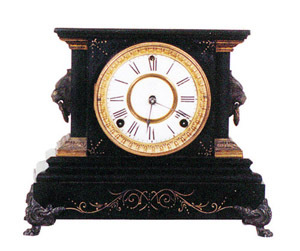 Ansonia Clock Co. enameled iron case black mantel clock, "La Duchesse", ca 1880. earlier enameled iron cases were thin and had no back door. You access the pendulum from underneath. 8 day, bell strike. You will need a pendulum and suspension to complete. Porcelain dial has some hairlines and chips around the holes. Beveled glass. Case is 10 inches high, 12 inches wide. Ly-Ansonia No.1009.